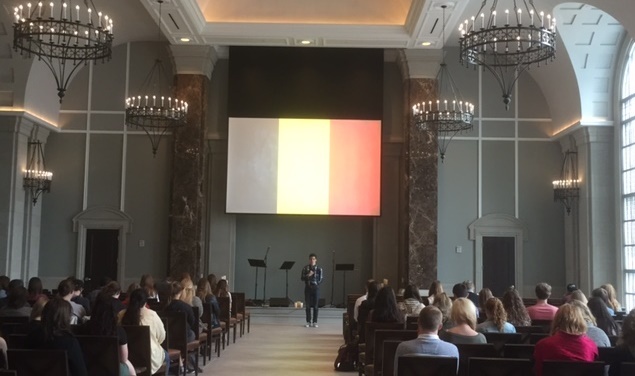 Belmont University students gathered on Wednesday morning for a moment of prayer during the University’s Chapel Service in honor of recent attacks in Brussels, Belgium. Associate University Minister Christy Ridings said Belmont believes it is important to allow students to gather in the aftermath of events like this so they can express their feelings, pray over victims and their families and feel surrounded by their community. “As a community of faith we must not become desensitized to the pain of our neighbors, across the street or across the world. By pausing to acknowledge events like those in Brussels this week, we come to understand more fully the brokenness of the world and the hope that only God can provide,” Ridings said. Belmont’s on-campus fountain shined with black, yellow and red lights on Monday evening in observance of the day’s events.